Google commemorated its 15th birthday on September 27th, 2013 with the launch of its new search engine algorithm – “Hummingbird” – the first major modification since its last Caffeine update in 2010, according to Amit Singhal, Google senior Vice President. What called for the change? Amit Singhal was found stating that, the new algorithm is clearly more focused on ranking sites better for relevance, while Caffeine was more focused on better indexing and crawling of sites. 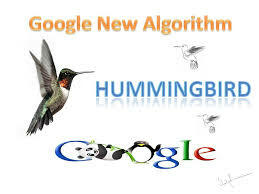 Although Hummingbird was compared to Caffeine, they differ in the fact that the former is an infrastructural as well as algorithmic change whereas the latter was only an infrastructural change in the search engine. The algorithm (read methodology) doesn’t imply any change for SEO’s. It is only meant to assist a user in effective navigation on the web. It was reported that Teddie Cowell, Director of SEO at Mediacom, stated, “Hummingbird is the natural convergence of two roads search has been on, firstly providing more intelligent, accurate and useful information responses, secondly making how we request and access that information as natural to us as possible”. It provides a more user-friendly platform for all ‘search queryists’ in terms of relevance, precision and speed. Hummingbird is an attempt on Google’s part, to cope with an expected rise in demand for ‘voice searches’ and a preparation for its preference over keyboards as input devices, in the coming years. It also signals the need for improved quality and more user-oriented content on the web. ● Accuracy and speed. Therefore, the name! To describe the last point, it would be important to understand that this algorithm helps Google search go the extra mile by attempting to understand the user’s precise intention of search instead of randomly providing results based on keywords used in the query. This is done by a systematic analysis of the query words to form an intelligible sentence that becomes the trigger for search rather than the individual words itself. Basically, Google intends to read the mind of the user to the extent of furnishing results that are tailored to meet the specific need without beating around the bush. It narrows the search and thus, saves time for users who end up getting lost in a maze of redundant information-crammed sites. So how does Google design an exclusive personalized search for users? Based on its Knowledge Graph, it utilizes its prior experience to generate improved intelligent results. This emphasizes on leading the user to a more relevant search result that rises out of its access to the user’s information as well. It relies on semantic search of old information in a whole new way to enhance efficiency and effectiveness of a search query, more so for mobile users. This new search algorithm discreetly made its way into use in August 20th, 2013. However, the change in the search methodology wasn’t realized even after a month of its implementation simply because it had not affected site rankings or stirred up any cognizable change in the search engine traffic. So far, there have been no signs of a negative feedback on this update. Joe Friedlein of Browser Media believes that it is too early to really tell whether the Hummingbird is going to be a massive game changer but it is claimed that it will affect around 90% of searches, so it is not something to be ignored! Google considers the Hummingbird to be a stepping stone towards its goal to mimic human interactions. So far, Google has kept its promise of striving towards producing “best results”. The Hummingbird is regarded as one such venture. It has, certainly, a long way to go in proving its usefulness to ‘queryists’ and site owners in the long run. It is speculated that the search engine algorithm will be incorporated in Google’s iOS and Android versions in the near future to enable personal appointment reminders and other new features using Google Now. This would facilitate interaction with users and not just provide links to other sites. Google has been continually seeking customer satisfaction in all its technological endeavors and this is hoped to communicate a message to other avenues of business markets as well.